Thread: Nusa Barung, Mystically Beautiful! Nusa Barong Island is located in Jember regency, East Java, and this island is one of outstanding natural charms in Java. The island is similar to Phi-phi Island in Phuket. The beach and the nature is very amazing, as there is no limits to its beauty. It may less famous than Sempu island or Karimunjawa island, but the charm of Nusa Barong island is can not be underestimated. It is located in the south of the island of Java and be a part of Jember regency. This island is one of the outer islands of Indonesia, that located in the Indian Ocean and is bordered by the states of Australia. This uninhabited island is a nature reserve since 1920. In this island, we can be found many species of birds, insects, and plants. The principal function of this nature reserve is a refuge for ebony leaf monkey (Trachypithecus auratus) which are endangered and have the type of flora including Calophyllum inophyllum, Sonneratia alba, Sterculia foetida, Terminalia catappa, Avicennia spp., Barringtonia spp., Alstonia spanthulatus, Alang-alang – imperata cylindrica, Dillenia sp., Ficus sandpaper, Lumnitzera spp., Pleiornium sp., Rhizophora spp., Supatorium sp., Tamarindus sp., Vatica walichii, Vitex pubescens, Xylocarpus spp. Nusa Barung is an island that consist of rocky groups that spread beautifully and it has magnificent white sandy beach and natural forest. Moreover, this island is also having unique and endemic flora and fauna with very fresh air indulgent. This virgin island is perfect to refresh body and soul. The beauty of underwater in this island is way more enchanting. The visitors can do snorkeling around the beach while accompanied by marine fish and beautiful coral reef with blue and sparkling water. However, it is advisable for not to swim too far in the middle, for it has huge waves. Nusa Barong Island is famous for its cluster of beautiful stones. The stones are large and looming with sturdy, glance looks like a temple. 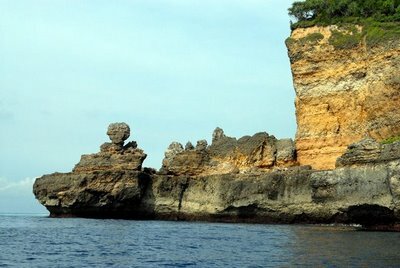 In addition, the beauty of the cliffs around the beach will make you amazed. It is a unique and fascinating. All times are GMT +8. The time now is 01:04.